Let the Y trainers put you and your friends through the ultimate training experience. 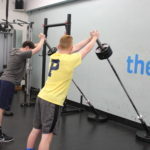 Designed for middle school and high school students, small group training at the Darien Y is designed to make you stronger, fitter and faster. The best part is you can do it with friends. Contact our Wellness Center to book your sessions.